No, we haven’t fallen off the face of the Earth, but we have been busy in a different sort of way than the busyness of traveling regularly and enjoying new sights, sounds, food, and folks. Jim, Chewie, and I arrived back in Tennessee the first week of September. If you’ve read 14 Unbelievable Months, you know that we headed back to Tennessee for two reasons: for me to help family and for Jim to be able to fly out of his home airport, Nashville. Our first week in Tennessee, I was able to visit with our youngest son and his family while Jim continued on with his “flying gig.” Of course, this meant visiting with our grand Hershel, and even Jim took some time to visit and play before flying away. After months of constant travel, our truck and camper needed maintenance and repairs, so the next three weeks were spent at Green Acres in Savannah. We had a whole of lot of things done to both the truck and camper, but Jim and I also needed our medical check-ups, labs, and annual vision exams. Dental appointments didn’t work into this visit, so we’ll have to get that done somewhere soon. While I dealt with the maintenance and repair stuff, Jim drove back and forth to Nashville’s (BNA) airport to continue the work project. 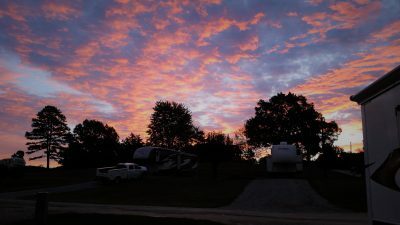 I did get to enjoy some beautiful sunrises on this stay at Green Acres RV Resort Park. It was during this time that we got some sad news. Our primary caregiver for my Mom turned in her two-week notice. She had been offered a full-time job working with Special Needs. With a daughter with Down Syndrome, she felt like it was a job that could benefit her family in more than one way. While happy for her, I was sad for us. At the same time, this change is more easily managed with me in the area, and I had come back to help Mom more anyway since my brother, who lives locally, has a huge work project that is going to be all-time-consuming for him until into January. First things first – Jim and I had to find a spot to park for several months, preferably between Mom’s home and Nashville. With a recommendation from a friend, we found a spot – the only spot available in a mixed RV/Mobile Home park. It is nothing to brag about, but it has full hook-ups and weekly trash pick up. It is affordable, and we can stay as long as we like. That works. In addition, the location is almost exactly half-way, time-wise, between my Mom’s and BNA. It is also half-way between our son and his family and my Dad’s, and it is only about 3 to 3 1/2 hours from where our youngest daughter is getting married in December. Unfortunately, the rules of the park require RVs to have a “hard” connection to the sewer. This took a few hours and $75 to make happen, but we got it done. Then, and only then, could I begin the search for a replacement caregiver. However, the first week in the park in which we had settled to sit for a spell was also the first week without the caregiver on the job at Mom’s. I had to get us truly settled in, take care of Jim’s work travel, etc., deal with regular weekly chores, get Chewie to a vet, begin the search for a replacement caregiver, and care for Mom (which still lives 28 miles from where we are) – all at the same time. I had 13 people apply for the part-time job. I was able to eliminate a few via messaging, and then I conducted phone interviews. A few more were eliminated that way. Yesterday, I began in-person interviews of the five remaining candidates; that will be wrapped up this afternoon. Once background checks are in and references have been checked for the final three, I can, hopefully, make a decision and get someone working by sometime next week. Once things are back on track, I should have time to prepare our camper (and our clothing) for winter in southern Middle Tennessee, get things ready for Thanksgiving, Christmas (remember other than parents, siblings, our six children and spouses/spouse to be – we have 10 grands – that’s a lot of shopping/wrapping/planning), and Clarissa’s wedding, which is actually two days before Christmas. Yeah, I think we’ll have enough to keep us busy while we are not traveling, but you can bet that Jim and I will be plotting and planning for our next opportunity to get our home on the roam again.